In an interview published yesterday, Hideo Kojima said the upcoming Metal Gear Solid V: The Phantom Pain would be his last Metal Gear game. I thought that sounded familiar, so I did some researching. Turns out... well, let's take a look. IGNPS2: When you're done with [Metal Gear Solid 2], would you like to go on and do something totally fresh or would you rather make a follow-up to an older game, like Snatcher, Policenauts... or... a Tokimeki Memorial Drama CD? Hideo: (Laugh) I want to do something totally different, but I've been saying this forever! I said that right after MGS, too. "I really think that Metal Gear has to live on in some form," [Kojima] confesses. "But as I said at the end of Metal Gear Solid, I really think it is time for me to hand the director role over to someone else. I might do the initial planning for the next game but not much more than that." "Metal Gear Solid 3 is the final chapter in the Metal Gear Solid series," [Hideo Kojima] said, reiterating the message that accompanied the announcement of Metal Gear Solid 4 for next-generation consoles during the Berlin leg of the tour recently. "From the beginning of March we've travelled through Berlin, Paris, Madrid and now we're finally here in London. And it is an honour to be part of the last moment of the last event of my last MGS. "We've been working on the MGS games for the last ten years, and I'm really happy and confident to present you the final Metal Gear Solid game," he added, before going on to talk about the European extras. "This fourth [Metal Gear Solid] is going to be the final one for me and Shinkawa," stated Kojima, revealing that the series' art designer, Youji Shinkawa, will be exiting with him. "There are other things that [we] want to create." Hideo Kojima: I was supposed to end this in MGS2, you know, originally (laughs). And then I created MGS3, and I said, 'Okay, this is the final one. It's over.' But people said, 'No, there's still not enough answers (in that game)!' As a game design, the story was almost complete in MGS1, 2 and 3, or so I initially thought. But of course, there were some questions that weren't answered, especially with some things after MGS2. I didn't decide that this was the timing – there were a lot of voices saying, 'We want the answer to all of the questions!' That's why as a game, and as a saga, MGS4 is the complete wrap up. PR-wise, I really don't want to say that this the final game or this is the wrap up, but if I don't say it, people will make me create MGS again! (laughs) So I have to say, 'Die, Snake,' and really end it so I can move on to something else! (laughs) Actually, it's a game, so even if Snake dies, the game can live on. We have to kill him at a certain point. Once again I'd intended for MGS3 to wrap up the series, but so many people wanted to know what happened after "2". Things like the identity of the Patriots and so forth. I had planned on leaving those mysteries as mysteries, but people weren't convinced that the series was wrapped up. So ultimately we ended up making "4". When work started on it, though, I began to wonder if my message of what we should pass on to future generations had truly gotten through, both to players and my team. After all, I've been conscious of the fact that this really is going to be my final Metal Gear, which means the team is going to have to continue the series themselves after I step away. However, it hit me that maybe there are some things you can't pass on. A person's will, thoughts, and emotions aren't encoded into their genes, and they aren't a part of memes either. If you group together those remaining factors, you're left with a person's sense, and that's the theme of the game this time around. That's why this is definitely my last Metal Gear and the end of Solid Snake's story. There probably will be a Metal Gear Solid 5, but it'll more than likely have a different world, characters, and story. "In Guns of the Patriots [Snake] was supposed to die. Everyone on the staff really wanted to keep him alive, so I caved a little. I did have the feeling that I wanted to end the series, but looking back at it now as a producer, I think as long as people want to keep on playing it, I want to keep on meeting that demand. So I don't think it's a bad thing." So in a way I guess I'm taking advantage of that to try new things, because every time I work on any game, be it Metal Gear or something else, I try to make new things. So for me, my challenge right now working on Metal Gear is, while preserving the elements that make it Metal Gear, to do all the new things I really want to do. And this time — I'll say it again — this is the last one. Not the last Metal Gear, but the last one I'll work on. This is my focus when I go into working on a game. Every game I make, I create thinking it's really, really going to be the last game I create. So I put as much as I can in and make sure I have no regrets. "I always say 'this will be my last Metal Gear,'" Kojima said, "but the games in the series that I've personally designed and produced — Metal Gear on MSX, MG2, MGS1, 2, 3, 4, Peace Walker, and now MGSV — are what constitute a single 'Metal Gear Saga.' With MGSV, I'm finally closing the loop on that saga." 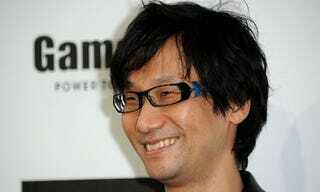 "In that sense, this will be the final 'Metal Gear Solid,'" Kojima continued. "Even if the 'Metal Gear' franchise continues, this is the last 'Metal Gear.'" Surely this must be the last one. Surely.